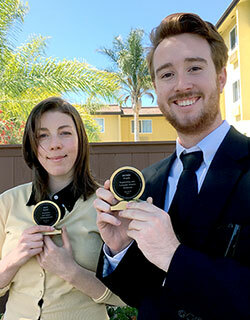 HSU students took home first and second place awards at the 31st Annual California State University Student Research Competition at Cal Poly San Luis Obispo. First place winner, Meghan Ueland, and second place winner Jacob Rada. Meghan Ueland won first place for an undergraduate competing in the Humanities and Letters category. Ueland, a history major, won for her project “A Historical Investigation into the Chinese Expulsion from Eureka, California.” She is advised by Robert Cliver, Chair of the Department of History. Jacob Rada, won second place as a graduate student in the Engineering and Computer Science category. Rada’s project “Comparison of PV Module Performance before and after 11, 20, and 25.5 Years of Field Exposure,” was advised by Charles Chamberlin, Co-Director, Schatz Energy Research Center. In total, nine students represented HSU at this annual statewide competition, which brought together outstanding student researchers from the 23 CSU campuses to compete for research awards in discipline-based categories. Judges included experts from corporations, foundations, public agencies, and colleges and universities. 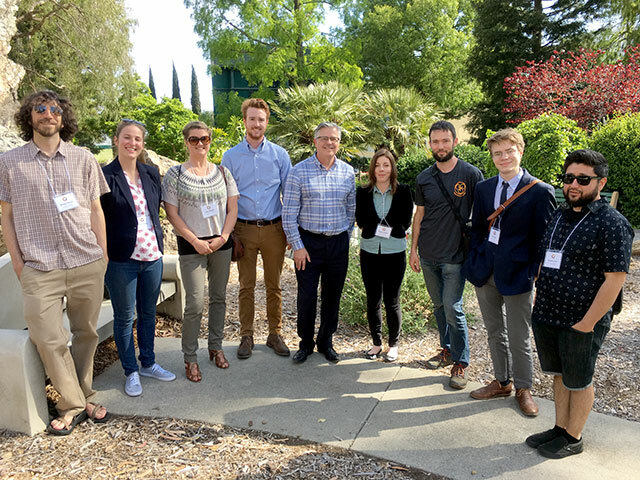 Students who represented HSU at the CSU Research Competition are (left to right): Michael Vernon, Lauren Smith, Laura Morgan, Jacob Rada, Steve Karp (Dean of Research), Meghan Ueland, Galen O’Toole, Sean Haas, and Ricardo Cueva. Not pictured: Dennis Hernandez.